Judy Joel was brought up in Chichester, UK. She worked for the BBC as a production assistant for many years in the 1960's and 70's and only after this did she pursue a career in art. She is entirely self taught and is best known for her naive style paintings which are fantastically fun colourful pieces. 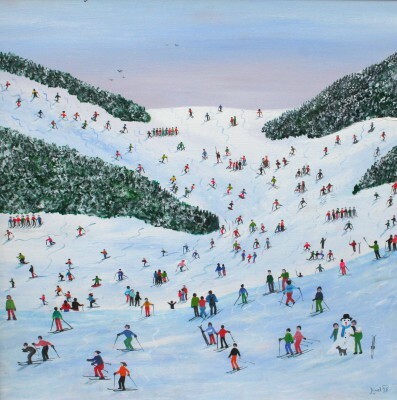 She likes to paint busy beaches, harbours, towns and cities as well as skating rinks and ski slopes. Judy always puts her Mum and a dog in every painting, as a tribute to her Mum. In addition to these paintings Judy also enjoys commissions to show a special day such as a wedding, family story or event. For further information on this please contact the gallery.